This month we’re giving away our popular MAXbag! This extra-large makeup bag fits all the beauty essentials you could possibly need for a weekend getaway. The spacious inside also features side pouches for convenient access to your smaller beauty items such as lip balm and bobby pins. This bag is perfect for keeping you stylish and organized on the go! Go to the Sigma Beauty website and pick out your favorite item. Then simply fill out the form below telling us your favorite item as well as which color MAXbag you would like to receive if you're the lucky winner! (Remember to hit "Submit Form")! One winner will be chosen at random (using random.com) and announced on the blog early next week! Stay tuned and stay beautiful! My favorite item from Sigma is absolutely the make me up brushes. I love the teal color MAXbag. My favorite item is the incredible F80, is amazing for foundation. 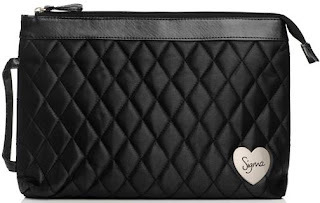 My favorite item from Sigma the premium travel kit in stylish black. I love the purple max bag. My favorite thing is the 12 brush kit - Make Me Crazy, which I still don't own yet, but it's been on my wish list for a while. I just love, love, love that color combination. And if I were lucky to be your winner, I would really like to have the purple Maxbag. Thank you for the giveaway :). My favorite iten is Mr. Bunny Black Essential Kit! My favorite color of MAXbag is Bleu. My favorite item is the Miss Taylor Kabuki, which I own and love! I'd like to have the black Maxbag. My favorite iten is 12 Brush Kit - Make Me Classy - Black! I love my Sigma Angled Contour brush F40 - I use it everyday! I am in love with the Turquoise bag. So pretty. kathieross@gmail.com. Thanks! My favourite item is the Make me Classy kit. I would love the Black Maxbag please! My favorite item is the Sigma 12 Brush Kit - Make Me Cool - Aqua. I love MAXbag black. thanks for the draw, I love you so much! My favorite product of Sigma is the Kabuki Brush Synthetic Flat Top - F80. The MAXbag I like best is black. I would love to win the black MAXBag, so classy! My favorite item is the Naughty In Black Travel kit - I love it! and I love the MAXbag in Bleu. I really like the black MAXbag. My favorite item from Sigma is the Synthetic Precision Kit. Color: The teal bag is so pretty! My favorite product is the Make Me Cool Kit. Thanks for the giveaway!! My favorite product of Sigma is the Kabuki Brush F80. Perfect! The MAXbag I like is black. My favorite product is Mr. Bunny travel kit,. I just love the sigmax brushes and I'm so happz there areeye brushes, not just face in sigmax line. 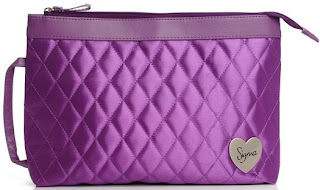 my favorite product of sigma is the make me cool travel kit pink.the maxbag i like is violet . My favorite product is the Mrs. Bunny Blue Essential Kit! And I would love the teal Maxbag! I`m so in love with the fabulous F80 ♥ I`d love the black Maxbag :)) thanks so much!!! My favorite product is the Complete Kit without Brush Roll - Black!!! And I would love the teal Maxbag please! *- my favorite item is the "Complete Kit without Brush Roll - Black" this is a perfect set! it has been on my cart for like 3 months now and hope i can afford it soon. :) i think you guys made a perfect kit with everysingle brush you included in the set. My favorite item is the kabuki F 80 . Its the best ever ! My fave product is Mrs. Bunny Blue Essential Kit but there is more and I would choose the purple color for the Maxbag. I would choose the purple color for the Maxbag. My favorite item is the Eyes Kit. Everything you need to makeup the perfect eye. MAXBag in Bleu is fab! My favorite item from Sigma is absolutely the Mrs. Bunny Kit collection brushes. I love the black color MAXbag. I would choose the black color for the Maxbag. My favourite item is the Make me up kit. I would chose The MAXbag in blue color. My Favourite item is Make me Crazy brush Kit and Dry'n in shape. Thank you for amasing giveaway! MAXbag is my favorite color of Bleu. I would choose the violet color for the Maxbag. My favorite product is the make me up brushes kits! Max Bag it's beautiful in version black! The precision angled brush P84 has to be a fave brush of mine. This was gifted to me and it's fabulous! I'd pick the aqua color....it's a refreshing color! My fave product is the Make me crazy Kit in purple, I hope have one sooon!! And I would love to have a MAXbag in purple too!! my favorite item would be 12 Brush Kit - Make Me Crazy - Purple. I would love to win..Good luck everyone..
item Eye Shadow Palette - Flare Make Me Crazy i love but My favorite item from Sigma is absolutely the make me up brushes. I love the teal color MAXbag. My favorite item from Sigma is absolutely the 12 Brush Kit - Make Me Crazy - Purple.which i own it. And I would love to have a MAXbag in Purple. 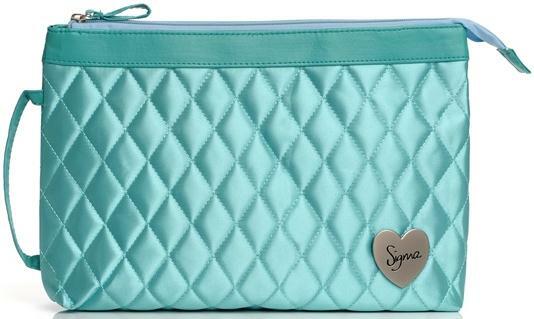 My favorite product of Sigma is Mrs. Bunny Blue Essential Kit! And the MAXbag I like is Bleu one! The MAXbag I like is black one! The black MAXbag is my fav ! My Favorite is Eye Shadow Palette - Flare :D i really hope im picked even though it is at random :D The MAXbag blue is my FAV!.. Great giveaway, thank you Sigma !! My favorite item is synthetic kabuki kit, and my fav. bag is purple. I have tried to complete the form, but it didn't say that I entered succesfully, so I am writing here too (hope it is ok). I like MAXbag in violet. my favorite product is the nice in pink travel kit, i think it has all the must-have brushes. I couldnt see that it was succesfully added.so i will enter it again here. My favorite item from Sigma is the Kit Make Me Classy in Black. I like the MAXbag in violet. Wasn't able to send the form so I am posting my comment. I really love Make me Classy and I would like so much the purple Maxbag. Meu item favorito e sonho de consumo é o Premium Professional Kit with Brush Roll na cor Black! com esse kit minhas makes irão ficar perfeitas! !